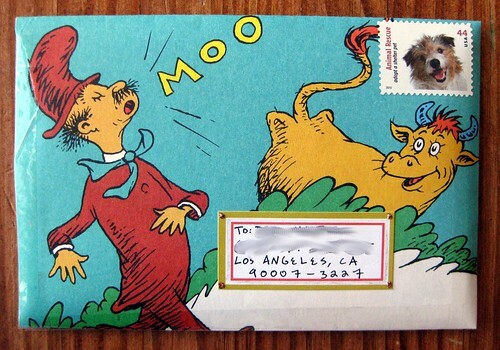 I made this envelope from a wonderful, colorful page of the Dr. Seuss book, "Mr. Brown Can Moo." The picture makes me happy. gotta love the dr seuss . Haha, that's cute! Love the cow's face! I made a set of Cat In the Hat artistamps some time ago. When I get unpacked and find them I'll send you some. 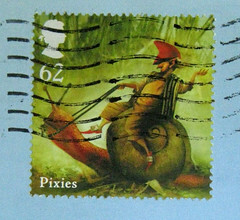 Danielle in Japan, I am not at home this week so I can't go through my letter pile - but I know I received at least one lovely postcard from you, and possibly a letter? In any case, I remember you and your postcards, so if you're asking because you want to know whether you can enter the pen-pals only giveaway - go for it! This is beautiful! Wow. Mr. Brown can moo me a letter anytime. What a great idea to make envelopes out of children's book pages. Very cute!